The GearWrench 82306 Punch and Chisel 27 Piece Set offers wide ranging versatility in one convenient package. The GearWrench 82306 Punch and Chisel 27 Piece Set contains 8 Cold Chisel pieces, 6 Pin Punch pieces, 3 Center Punch pieces, 4 Long Taper Punch pieces, and 6 Starter Punch Pieces. The GearWrench Center Punch is used for marking center lines and pilot drill locations. The Long Taper Punch is used to install and remove pins and shafts and to align holes. A Starter Punch is used for both starting and installing pins and rivets. Chisels are for cutting rivets, bolts, and nuts. A Pin Punch is for final removal to drive out pins and rivets. GEARWRENCH electrical wire stripper and crimper. GEARWRENCH 3/8" drive 6 point SAE/Metric standard and deep mechanics 56 piece tool set. GEARWRENCH 1/2'' drive 6 point SAE/Metric standard and deep 49 piece mechanics tool set. GEARWRENCH 1/2'' drive 6 and 12 point metric standard and deep 28 piece mechanics tool set. GEARWRENCH 1/4'', 3/8'' and 1/2'' drive adapter 4 piece set on socket rail. 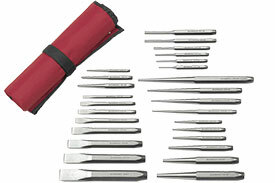 GEARWRENCH punch and chisel 27 piece set. GEARWRENCH metric hollow shaft cushion grip nutdriver 7 piece set. GEARWRENCH sae hollow shaft cushion grip nutdriver 7 piece set. GEARWRENCH 1/4'', 3/8'' and 1/2'' drive 6 and 12 point SAE/metric mechanics tool 118 piece set.